in Brandon. There was also an interesting Veteran Display. Many participated in the cribbage tournament and at the Legion bingo. Friday, July 14, was Decade Day. The 'Bone Rattler' Pedal Tractor Pull was enjoyed by young and old alike. The Erickson & District Hospital 50th Anniversary Tea, the Legion Open House, and a traditional pow-wow kept every­ one busy during the day. Rolling River First Nation sponsored a native feast. The evening featured a Decade Concert, sharing music and dancing from the decades of the 20th century. Saturday, July 15, Homecoming Day, was celebrated with a buffet supper and Homecoming dance. Sunday, July 16, was farewell Day. The celebration climax was the Inter-Faith Church Service. All the churches in the area took part in this moving service. Past Bishop of the Evangelical Lutheran Church in Canada, Donald Sjoberg, one of the boys from home, was the guest preacher. During the ten days there were school reunions held at the 'once-upon-a-time' school sites. The Decade display at the collegiate, sponsored by the Erickson Women's Institute, brought hearts back to the' good old days'! The church displays at the collegiate also brought back many fond memories. The Millennium Minstrels, the community singers, added fun and music to the Homecoming celebration. commended for all the work put into making Homecoming 2000 a great success. It was ten days of not having to cook at home; and ten days when smiles, handshakes and hugs were plentiful. It was all worthwhile having folks come 'home' to share in this event. Profit from the Homecoming celebration has been given to community projects and one thousand dollars has been set aside for the next celebration. 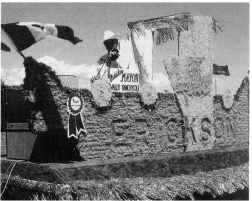 Town of Erickson float at the Homecoming 2000 Parade. Mayor Wally Yanchycki is seen fiddling away, accompanied by his electronic drum. This same entry was awarded first prize at the Travellers Day Parade in Brandon during the Summer Fair 2000.